Congratulations to the winners of 2016. This incredible achievement means that the international leaders and influencers of South Australia consider these companies to primed for profound growth due to world class capabilities. They will receive dedicated support from the South Australian business community to globalise the economy. 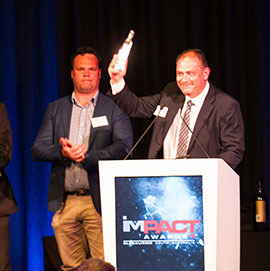 A worthy Hall of Fame winner, Ian has played a significant role in the exporting of over $1.5 billion of high-tech equipment, generating high value employment and intellectual property to become and remain a world beater for over 50 years. The supplier of choice for large scale events, such as the Olympic games. Billions of people have seen and been stunned by their fire displays. Launched into the US and Middle East markets with a new disruptive technology for managing the fuel for large fleets. Now expanding into China, this company is taking on the world’s largest population with innovations in child learning and development. Specialists with ship-helicopter integration, pilots and crews around the world place their lives in the hands of this system, to safely land when pushing the limits of operational safety. The recognised leader in civil engineering technical advisory, Tonkin Consulting has designed and planned most of South Australia’s infrastructure and is now branching out into new industries and markets. Competing against large multinationals, Tonkin Consulting is forging its way to exploit their specialised capabilities to make cities work better.